Welcome to Eyecare of the Valley, P.C. Comprehensive vision care for the whole family! Welcome to Eyecare of the Valley. At our practice, we strive to provide the highest level of optometric and ophthalmological services. We invite you to browse our website to learn more about our practice, and invite you to join our patient family by scheduling an eye exam appointment at one our three offices, located in Pennsburg, Emmaus, and Quakertown. Eyecare of the Valley is a full service eye and vision care provider. Our doctors and staff seek to provide the finest eye care in a friendly, professional environment. Patients throughout the Lehigh Valley area come to Eyecare of the Valley because they know they will receive the personal attention and exceptional care that is our foundation. Our team is dedicated to keeping our patients comfortable and well-informed at all times. At Eyecare of the Valley, we will explain every exam and procedure and answer all of our patient's questions. We offer financing options and will work with vision and medical insurance providers to ensure good eye health and vision care for all of our patients. Our one-on-one, patient centered approach makes the doctors and staff of Eyecare of the Valley the vision care providers of choice in the Lehigh Valley area. We provide comprehensive eye care services, including complete eye exams, contact lens services, glasses, ocular disease management, and pre- and post-operative care. For a complete list of services, visit our services page. At Eyecare of the Valley, we are dedicated to providing high-quality optometric and ophthalmologic services in a comfortable, friendly environment. Call us today to set up an appointment, or schedule an appointment today online. We look forward to seeing you! All exams with the doctor require an appointment. Dr. Eiss joined Eyecare of the Valley in 1995. He is a graduate of Muhlenberg College and the Pennsylvania College of Optometry. Dr. Pike joined Eyecare of the Valley in 2004 after practicing in the Allentown area since 1992. Dr. Campbell has been practicing ophthalmology in the area for over 40 years, with a medical degree from the University of Pennsylvania. Dr. Welch joined Eyecare of the Valley in 2011. She is a graduate of Susquehanna University and Pennsylvania College of Optometry. Dr. Foreman joined Eyecare of the Valley in 2015, and has lived in the area since his high school days at Bethlehem Catholic. We will do our best to accommodate your busy schedule. Schedule your full exam appointment today! If you need to change or cancel an appt please call the office. "The smartest thing I've done in years was to have a thorough eye exam. I am delighted with the decision I made... This is like having new eyes. 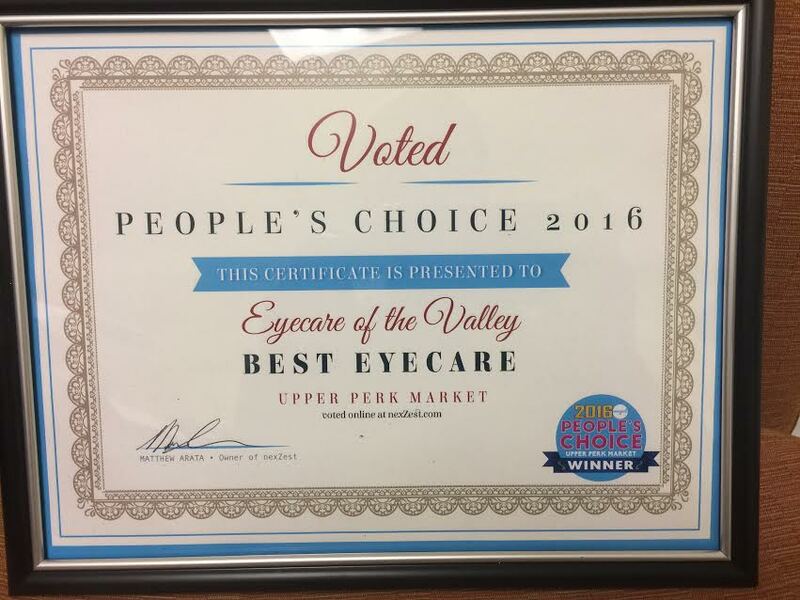 Thank you Eyecare of the Valley." "The staff, doctors and receptionists are all very friendly and the service I get there is always exceptional. Thank you!""